Tanzania leading airline Precision Air Services PLC, has announced the launch of scheduled flights to Serengeti National Park effective from 1st October 2017. 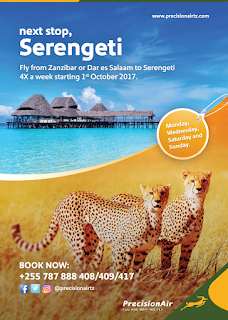 The flights will be from Zanzibar or Dar es Salaam direct to Serengeti every Monday, Wednesday, Saturday and Sunday. The announcement comes few weeks after the airline announced the launch of scheduled flights to Kahama effective from 5th September 2017. Effective from 1st October 2017, Precision Air will start operating scheduled flights to Serengeti National Park. 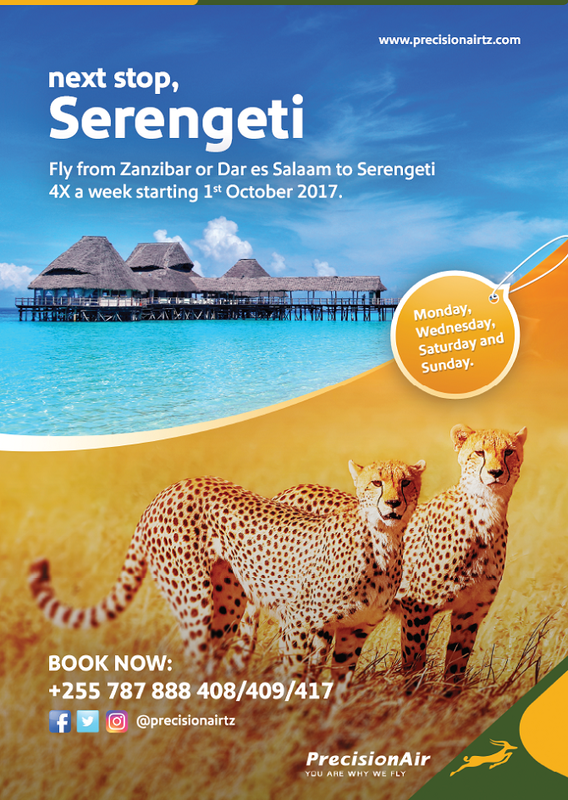 Fly from Zanzibar OR Dar es Salaam direct to Serengeti every Monday,Wednesday,Saturday and Sunday. Enjoy your time in the park or at the beach and let us worry about your flight." Precision Air seems to spread its wings all over the Tanzanian space providing affordable and reliable air travel services to its customers. The Serengeti National Park in Tanzania was established in 1952, in the Serengeti ecosystem in the Mara and Simiyu regions. It is home to the greatest wildlife spectacle on earth - the great migration of wildebeest and zebra. The resident population of lion, cheetah, elephant, giraffe, and birds is also impressive. There’s a wide variety of accommodation available, from luxury lodges to mobile camps. PrecisionAir is a public listed (DSE: PAL) Tanzanian airline, which is a leader in providing scheduled flight service to over 11 destinations within and outside Tanzania. Operating from its main hub in Dar es Salaam Precision Air flies to Arusha, Kilimanjaro, Mtwara, Kigoma, Tabora, Musoma, Mwanza, Bukoba, Zanzibar and regionally, to Nairobi and Entebbe. PrecisionAir is a member of International Air Transport Association (IATA) which audits the airline every two years to ensure that it complies with global safety standards, a key factor for all its members. It is the only Tanzanian airline that has passed and attained the IATA Operator Safety Audit (IOSA) certification.